Cousin Q's mom sent over some cherry tomatoes. While I happily snack on cherry tomatoes plain, I was in the mood for a very simple salad. I'm really not much of a lettuce salad person. I'm much more a chopped salad with chunks of flavorful vegetables person. My neighbor has an avocado tree that hangs over part of my yard. I'm not sure what kind of avocado tree it is. I know it's definitely not of the Haas variety with the smooth and buttery flesh. These avocados are hard, and even after turning black on the tree, remain hard. So I wait for them to drop on the ground. 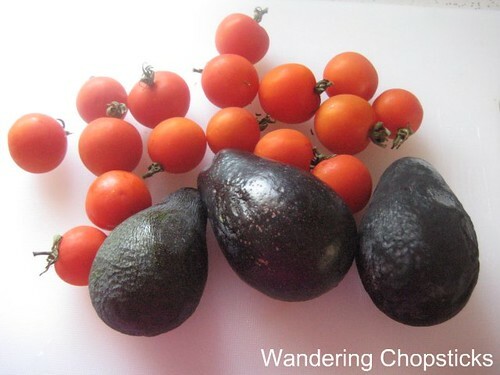 I'm not poaching when the avocados drop into my yard, right? Chop. Chop. Squeeze. Sprinkle. Sprinkle. Drizzle. Toss. What type of super simple salads do you like? 1 year ago today, Pesto with Arugula and Walnuts. One of my favorite quick and easy aalads is sliced cucumbers and onions dressed with sour cream, a splash of vinegar, a pinch of sugar, salt and pepper. 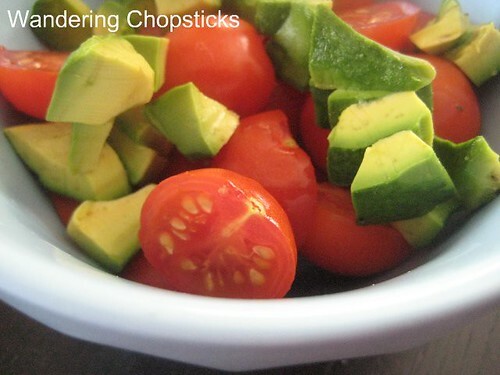 i adore avocado/tomato salad, it is my go-to salad always. i also add in chunks of english cucumbers (i don't like the other variety. it's not as sweet). i also love caprese salads. and no, i don't think you're poaching when they fall in your yard. i am so jealous, avocados are soooo expensive! Mini tomatoes of all sorts are always good by themselves :). Always sweet, tart, and very flavorful! Funny thing here, is that we bought some avocados one day, but even after weeks of leaving them alone, they still stayed green and were just starting to feel soft. The inside though looked like pastel green than the vibrant green shown in your photos! I wonder what type of avocado is that. Oh that sounds good too. I love cucumbers and vinegar. Sometimes that's all I need. I love Caprese salads too. Avocados are usually around 2 for $1, sometimes 4 for $1 here. I looooove tomatoes, small or large. I tried a bacon (?) avocado once that took forever to ripen. It didn't taste nearly as good as the Haas though.